It has barely been a week since it was announced that seasoned Ndebele artist, Esther Mahlangu will be teaming up with US singer John Legend in an HIV Campaign. 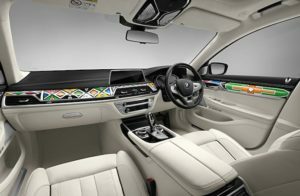 South Africans will be happy to know that she has now been commissioned by BMW to showcase her art in their new 7 Series. BMW Individual Manufaktur designed a special white coloured fine-wood trim in the interior of the 7 series for Mahlangu to paint and the car is on auction. A silent auction will be made at the Frieze Art Fair in London from 5 to 9 October where the car will be on display. It’s the second time that Mahlangu collaborates with BMW after she became popular in 1991 for painting the BMW 525i model.